Fairlady 2000 (Legends of Speed 1/10) … Confirmed on Lamley Group via Jun Imai’s Instagram account. ’68 Corvette – Gas Monkey Garage (HW Screen Time 3/10) … featured in an episode of Fast N Loud, confirmed by HWC Jimmy on HotWheelsCollectors.com. See the Gas Monkey Garage Facebook post >>HERE<<. Sky Dome (Experimotors) … name revealed in Jun Imai’s Instagram post, shown at HWC >> HERE. Speedy Pérez (Legends of Speed 2/10) … car shown via T-Hunted >> HERE. Corvette C7 Z06 (Factory Fresh) … casting shown on HotWheelsCollectors.com. Volkswagen Käfer Racer (HW Speed Graphics) … car shown via T-Hunted >> HERE. El Viento (Experimotors 4/10) … shown by designer Lindsey Lee at the LA Convention. Gotta Go (Experimotors 2/10) … shown by designer Brendon Vetuskey at the LA Convention. Porsche 934.5 (Factory Fresh) … shown at the LA Convention. Volkswagen T2 Pickup (HW Art Cars) … shown at the LA Convention. Tesla Model X (Factory Fresh) … shown at the LA Convention. Roller Toaster (Legends of Speed 4/10) … shown at the LA Convention. Aisle Driver (HW Ride-Ons 2/5) … shown at the LA Convention & by the Hot Wheels Instagram. Boom Car (HW Ride-Ons) … shown at the LA Convention. ’95 Mazda Rx-7 (Then and Now) … shown by Jun Imai at JCCS, covered by The Lamley Group. Mazda REPU (Rotary-Engine Pick-Up) (HW Daredevils) … shown by Jun Imai at JCCS, covered by The Lamley Group. Surf ‘N Turf (‘Tooned) … car shown via T-Hunted >> HERE. 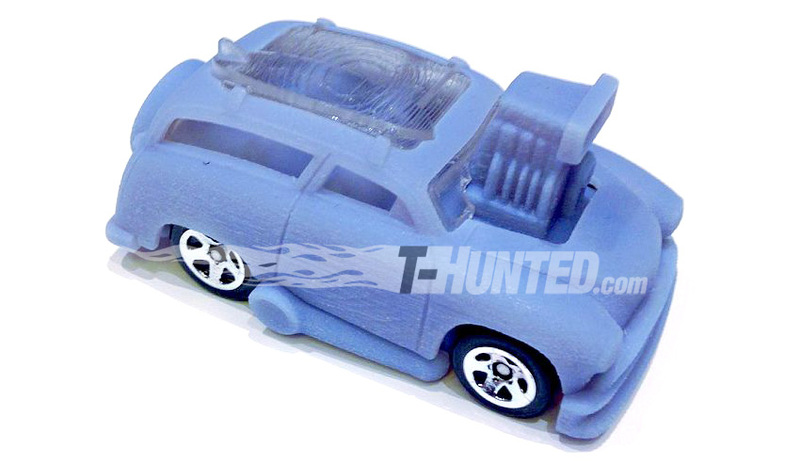 Turbo Rooster (Street Beasts 1/10) … car shown via an eBay sale >> HERE. Custom ’67 Pontiac Firebird (Muscle Mania) … listed on HWC in the Voting for the Collectors Choice ’18 HW Flames Collection, shown by @hotwheelsdreamteam Instagram. ’16 Ford GT Race (HW Speed Graphics) … shown by Ryu Asada in his Instagram post. Rig Heat (Legends of Speed 5/10) … car shown via T-Hunted >> HERE. 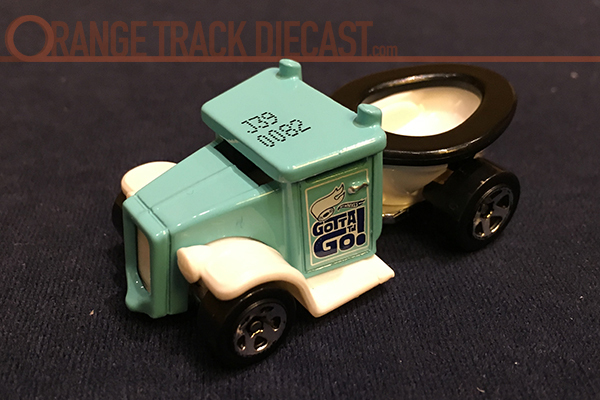 Flash Drive (Legends of Speed) … car shown on 2017 Mainline List, PIC HERE. Ice Charger (HW Screen Time) … car shown on 2017 Mainline List. Milano (HW Screen Time) … car shown on 2017 Mainline List. The Embosser (Experimotors) … car shown on 2017 Mainline List. Head Starter (‘Tooned) … car shown on 2017 Mainline List, PIC HERE. 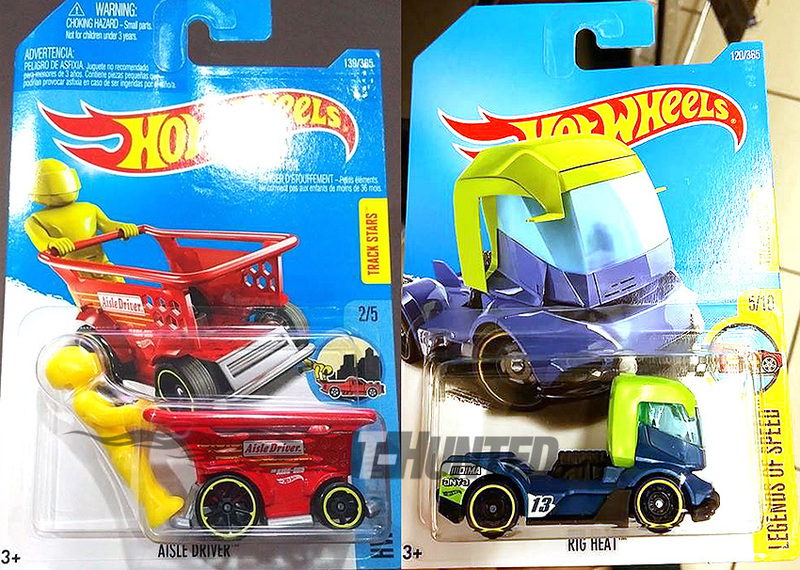 Baja Hauler (HW Hot Trucks) … car shown on 2017 Mainline List, PIC HERE. 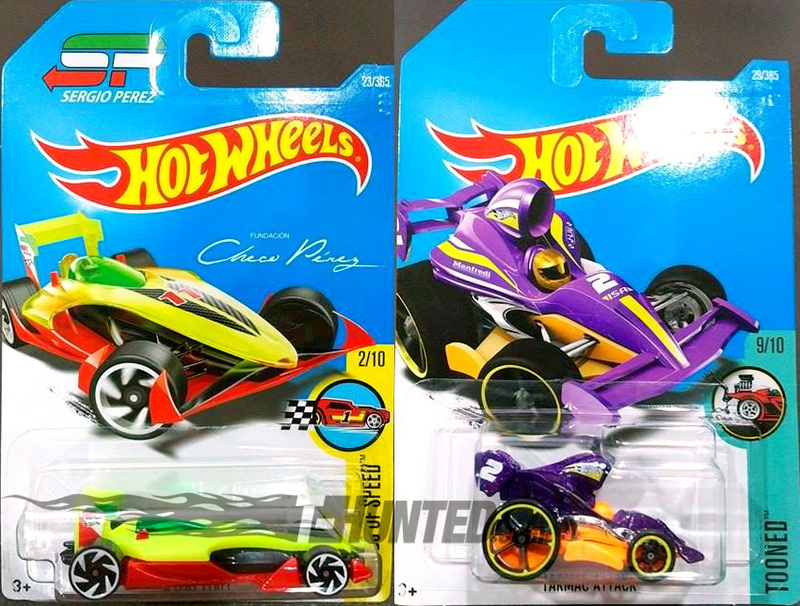 Crescendo (Super Chromes) … car shown on 2017 Mainline List, PIC HERE. 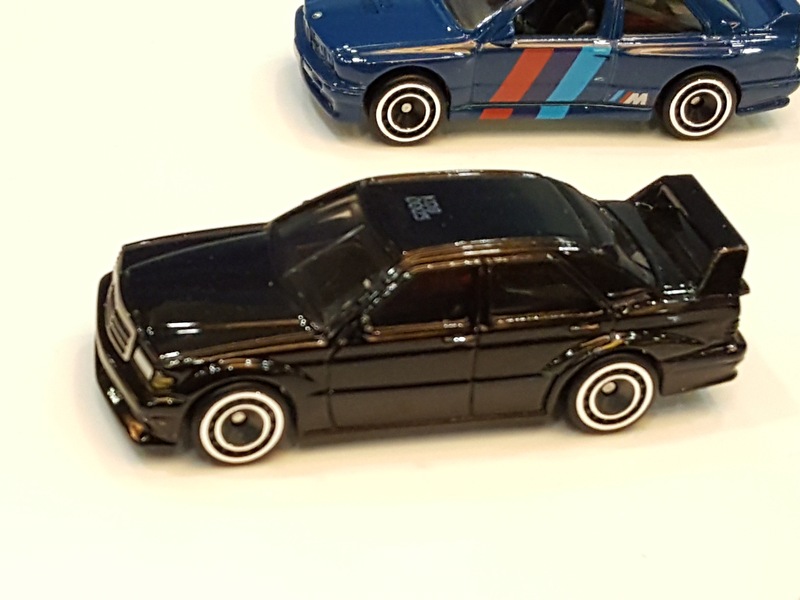 Quad Rod (HW Moto) … car shown on 2017 Mainline List, PIC HERE. 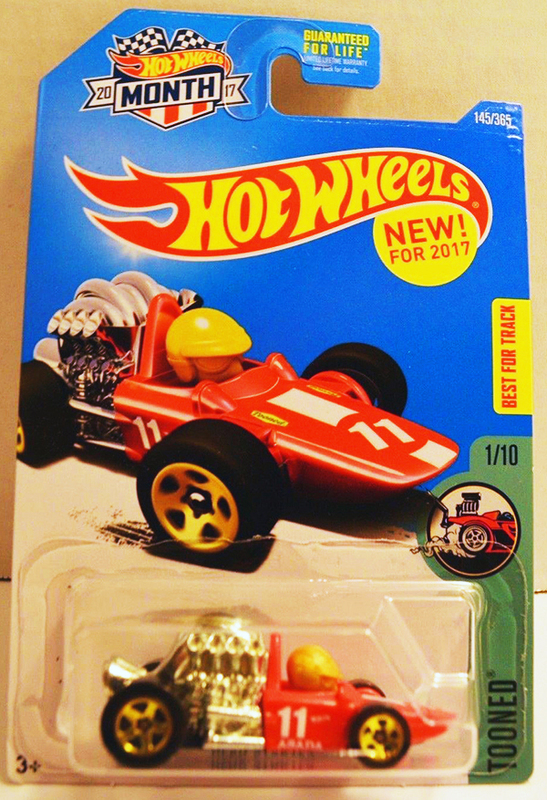 Track Hammer (HW Glow Wheels) … car shown on 2017 Mainline List, PIC HERE. Hotweiler (Street Beasts) … car shown on 2017 Mainline List, PIC HERE. Motosaurus (Street Beasts) … car shown on 2017 Mainline List. Rally Cat (HW Digital Circuit) … car shown on 2017 Mainline List. Sky Fi (HW City Works) … car shown on 2017 Mainline List. Time Shifter (HW City Works) … car previewed by @hotwheelsdreamteam on Instagram. ’17 Nissan GT-R (R35) (Night Burnerz) … car previewed by Jun Imai on Instagram. Solid Muscle (HW Digital Circuit) … car shown on 2017 Mainline List. ’17 Camaro ZL1 (Camaro 50th Anniversary) … car shown on 2017 Mainline List. ’16 Honda Civic Type-R (Then and Now) … car shown on 2017 Mainline List. ’16 Mercedes-AMG GT (HW Exotics) … car shown on 2017 Mainline List. ’17 Pagani Huayra Roadster (HW Exotics) … car shown on 2017 Mainline List. 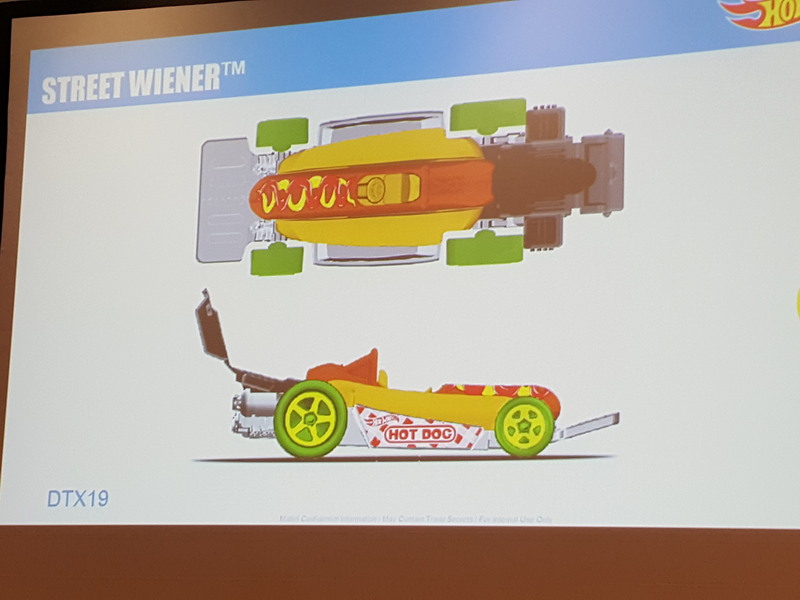 Street Wiener (HW City Works) … car shown at the Pittsburgh Convention. Gazella R (HW Exotics) … casting shown in eBay auction. UNSC Scorpion (Entertainment line, Halo Series) … from the video game, Halo, shown at the LA Convention. UNSC Gungoose (Entertainment line, Halo Series) … from the video game, Halo, shown at the LA Convention. ’60s Fiat 500D Modificado (Car Culture line, Air-Cooled Series) … shown at the LA Convention. Porsche 962 (Car Culture line, Race Day Series) … shown at the LA Convention and by GReddy’s Instagram. Mercedes 190E Cosworth Evo (Car Culture line, Modern Classics Series) … shown at the LA Convention, FEP at Pittsburgh Convention. ’60s Ford Econoline Pickup (Pop Culture line) … shown by @hotwheelsdreamteam Instagram. BMW M1 Procar (Car Culture / Cars & Donuts) … shown on T-Hunted. 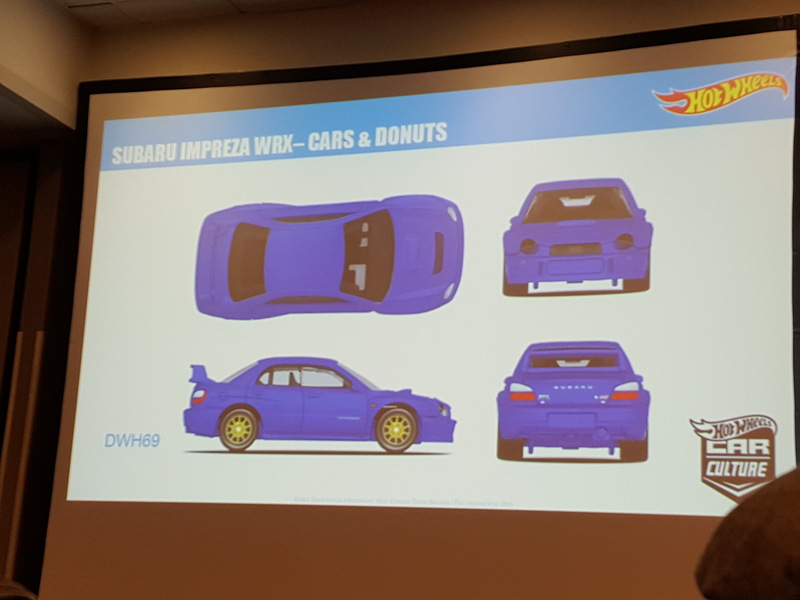 Subaru Impreza WRX (Car Culture / Cars & Donuts) … shown at the Pittsburgh Convention. Skeleton (from Minecraft) (Character Cars) … shown on HotWheels.com. Zombie (from Minecraft) (Character Cars) … shown on HotWheels.com. 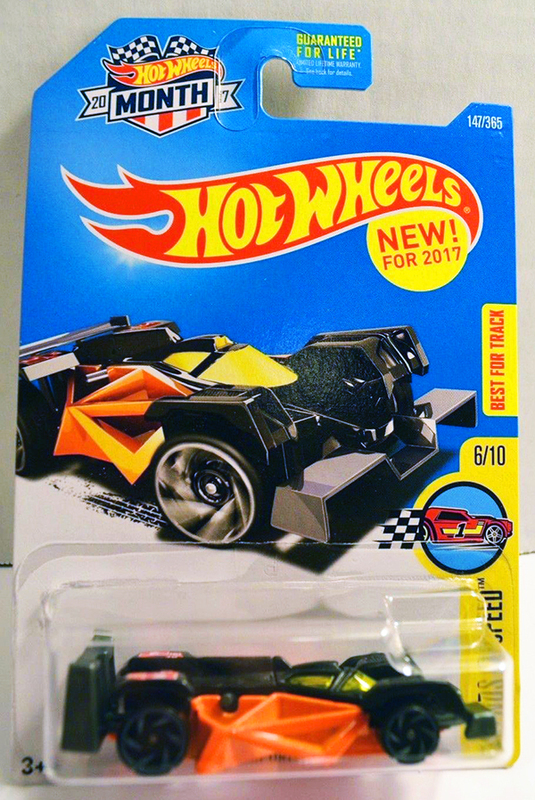 Spider (from Minecraft) (Character Cars) … shown on HotWheels.com. Iron Golem (from Minecraft) (Character Cars) … shown on HotWheels.com. Enderman (from Minecraft) (Character Cars) … shown on HotWheels.com. Creeper (from Minecraft) (Character Cars) … shown on HotWheels.com. Deadpool (from Marvel) (Character Cars) … shown on HotWheels.com. NOTE: The Gas Monkey Garage Hi-Po Hauler will be a new casting that will debut in the Red Line Club in 2018. Updated 08/15/2017 — Added link to Solid Muscle article. Updated 08/11/2017 — Added link to Mazda REPU article. Updated 07/27/2017 — Added Gazella R. List is finalized. Updated 07/19/2017 — Added link to Ice Charger article. Updated 07/12/2017 — Removed 2018 New Models and put them in the 2018 Tracker. Updated 06/01/2017 — Added Nissan C10 Skyline Wagon. Updated 05/30/2017 — Added Nissan Skyline C210 to Rumor Mill. Updated 05/23/2017 — Added link to Volkswagen T2 Pickup article. Updated 05/01/2017 — Mazda REPU to appear in HW Daredevils, and the Rally Cat is to appear in the HW Digital Circuit. Added Nissan C130 Laurel to other new castings for 2017. Updated 04/18/2017 — Added link to Surf ‘N Turf article. Added Subaru Impreza WRX (Car Culture). Updated 04/08/2017 — ’60s Ford Econoline Pickup will debut in the Pop Culture line. Updated 04/02/2017 — Added link to pic of Hotweiler. Updated 03/28/2017 — Added link to pic of Time Shifter. Updated 03/27/2017 — Added link to pic of Crescendo. Updated 03/24/2017 — Added link to pic of Quad Rod. Updated 03/22/2017 — Added links to pics of Custom ’67 Firebird, ’60s Ford Econoline Pickup and ’17 Nissan GT-R (R35). Updated 02/15/2017 — Added link to pic of Baja Hauler. Updated 01/05/2017 — Link to pics of Flash Drive & Head Starter. Updated 12/23/2016 — New Models on the 2017 Mainline List added. Updated 12/19/2016 — Rig Heat Added. Updated 12/09/2016 — Added the Custom ’67 Firebird and the ’17 Ford GT LM to the new models. Added note about Hi-Po Hauler. Updated 12/05/2016 — Updated Links. Moved Sung Kang’s Maverick to list from Rumor Mill. Updated 11/16/2016 — New Gas Monkey Garage Reveal added to Rumor Mill. Updated 11/05/2016 — Turbo Rooster Added. Updated 10/27/2016 — Sung Kang’s Maverick added to Rumor Mill. Updated 10/25/2016 — Surf Woody added. Updated 10/23/2016 — Two new Mazda castings added. 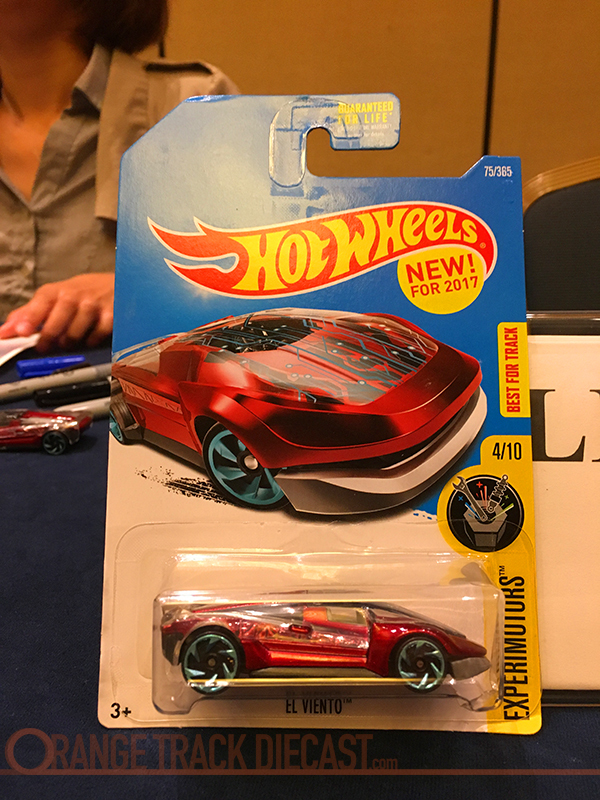 Updated 10/09/2016 — Major update from 30th Annual Hot Wheels Collectors Convention in LA. Updated 09/28/2016 — VW Kafer Racer added. Updated 09/23/2016 — Corvette C7 Z06 added. Updated 09/19/2016 — Sky Dome & Speedy Perez added. Emoticar is in Experimotors Series. Updated 09/09/2016 — Link to image shown by Gas Monkey Garage for their ’68 Corvette. Updated 08/21/2016 — Fairlady 2000 leak changed to confirmed. Updated 08/17/2016 — added 2015 Mustang GT Convertible & Aristo Rat, along with some series and numbering from Russian Hot Wheels site. 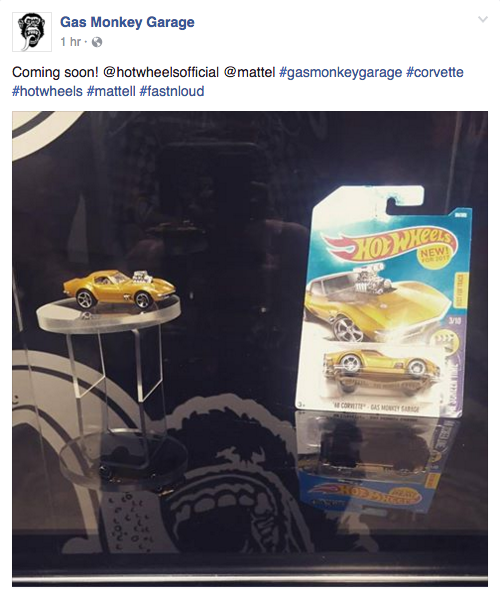 Updated 08/15/2016 — Gas Monkey Garage (GMG) Corvette moved from rumors to the list now that its confirmed. Updated 07/28/2016 — The mainline will be numbered #1-365. Each colorway will now have its own number … from The Lamley Group article. 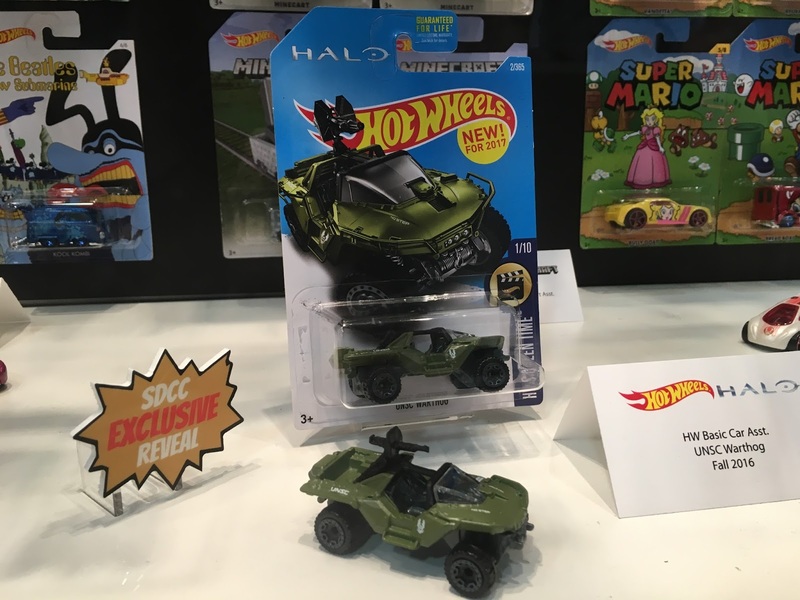 Hot Wheels UNSC Warthog from the 2017 HW Screen Time Series … also part of the 2017 New Models, from the Video Game, Halo. Are they going to make the Hennessey Venom GT, Lykan Hypersport, Bugatti Chiron, or Lamborghini Centenario? Nothing has led us to believe so, but its still entirely possible. This should be a new casting designed by Tyler Charest… not the casting from 2006. Not sure yet. We only have a name. We don’t have one yet. Will there be a 50th new model as they said? Nope. This will be it for 2017.